Don’t become complacent! You’ve heard the phrase before. 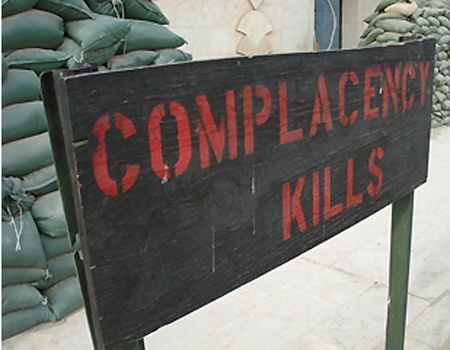 Personally, I think we have become complacent with the phrase and it’s time to implement a saying from the military – Complacency Kills! Complacency Kills. It’s short, it’s strong, the message is clear. First, a quick story on complacency. In 1997, having 150 high-hazard clients, I wanted to find out how to reduce the number of injuries occurring. I undertook a massive study, looking at everything from supervisor philosophy, procedures, age, gender, training and much more. I plugged in the data, met with the owners and managers of these companies. At the end of the day, employees were being injured during two periods of their tenure at these firms. In the first 7 to 30 days and then again after 2 years. Our finding was employees who were injured in the first 30 days were not properly trained and those that had been injured after 2 years had become complacent in their jobs. They slacked off, they stopped following the procedures, they let down their guard. They became complacent. If you look at your claims, I guarantee that you will find the same thing happening in your organization. When it comes to complacency, there is no area of our lives that this feeling hasn’t touched. We wear the same ole clothes, hairstyle, drive the same car, live in the same dirty office, take the same route to work, eat the same breakfasts, go to the same places for vacation, overlook our wives and girlfriends new haircuts, forget birthdays, watch the same boring tv shows and that’s just in our personal lives. In our professional lives, we copy and paste, fail to read the entire code, wait to give feed back, fail to write someone up for violations of rules, fail to verify the information we are give, fail to do safety inspections, never visit our remote sites, overlook procedural mis-steps and I am sure that you can think of 100 other ways you and your staff have become complacent. It’s rare to find someone that gets tough with themselves and keeps striving for more. And when we do find someone like this, we usually tell them they are being to hard on themselves and that they need to slow down and take it easy. We encourage them to become complacent. As risk managers, we must always remember that we are protectors of our employees. What we do really does save lives. In the military, you face being shot, captured or blown up. Our world may not be as dramatic as the military OR is it? If we fail to lockout the electrical panel, check the hydraulics in the aerial lift, tie off our tighten our fall protection harness, establish emergency procedures, forget to change our respiratory cartridge, couldn’t the same thing happen to us? I know, you say “but we are just risk managers.” That’s right, you are. And I see plenty of you walking the construction sites without hard hats, going in fall protection required zones without fall protection, in the shop without respirators, etc. You have become just as complacent as our employees. Let’s get serious for a minute – when was the last time you checked the air pressure in your personal vehicle tires? Or the oil level in your car? Or checked the seat post clamp on your bicycle – the quick connect on your bike tires? When was the last time oiled the garage door, checked the batteries in your flashlight, the virus protection updates on your computer, changed your password, doubled checked the claim file before making a decision, reviewed the current code before answering a question? When was the last time your exercised? We have all become complacent in some form or fashion. Now it is time to stop being complacent and start being diligent, observant and wanting more. It is time to level up your risk management program. To train your staff with a purpose. To not be comfortable with the status quo. To always check and double check before just routinely going forward. I would highly suggest taking a serious look inward and then set the example for your staff. I would also suggest that you consider getting off the beaten track with your training program and start offering some personal development training to your staff. And start with complacency training.